"Exhibit ties traditional craft together with computer technology"
"After Vermeer 2 (The Girl with a Pearl Earring)," by Devorah Sperber, is part of the exhibit "Threads" at Wood Street Galleries, Downtown. If the multicolored macrame that covers the railing above the descending staircase at the Wood Street "T" Station doesn't grab your attention, then the wigs on a wall inside Wood Street Galleries upstairs most certainly will. Both artworks are part of "Thread," the latest high-tech art exhibition to fill the Pittsburgh Cultural Trust's premier Downtown gallery. Organized by independent curator Michele Thursz, of New York City, "Thread" examines the notion of how computers, and especially Internet technology, manifest into extensions of our physical bodies and minds and, in turn, how all of that links together in our current culture. You might be thinking, what does macrame have to do with microchips? How do threads of yarn relate to the Internet? "There's different connotations to the word thread, both in art making and in today's high-tech world," Thursz says. "Thread can mean actual thread, as in the craft material, or it could mean the thread in a blog, which starts out as a conversation based on a topic. "The topic of this exhibition is the resurgence of traditional craft among artists who use technology, how artists are using traditional craft aesthetics but the back end of it is based on how technology affects culture." A perfect example might well be Ursula Endlicher's "Website Wigs" installation. The aforementioned work is literally a manifestation of the way Web sites are written, that is to say, how they are scripted and programmed. On one wall, Endlicher has arranged a half-dozen wigs, each representing a different Web site such as those of Microsoft, Apple, Google, Intel, one of the artist's favorite rock bands and the artist's own site. Here, the language of code is rendered in each wig, splayed out and pinned to the wall at various end points, particularly end points of braids, which are tied off in different color-coded hairbands. Looking like octopi or sea anemones, Endlicher says of the splayed wigs, "They're based on analyzing the hyperlink structure of those Web sites. I looked to see how many links there were on the first level and then followed all of those levels for steps down. And that's applied to the braids." For example, Microsoft has eight links on the first level, represented in eight braids with specific color-coded beads. From there, more braids come off with different-colored beads and bands. "It's data visualization," Thurz says. "It's a physical representation of the activity on those particular Web sites." Other works aren't as direct, but they are just as lighthearted and visually stunning -- particularly the collage-based works. Some are quite literal, such as the work of Michael Anderson, who takes a traditional approach to the medium of collage. Thursz describes Anderson as a "mad collector of mass media." But instead of pulling mass media messages from what comes into his home, Anderson hits the streets of New York City for his source material. That's evident in the two large-scale collages by him on display, "Gamblers" and "Vandalism." The former comprises movie posters that Anderson has ripped from walls and billboards around Times Square. The latter is made up mostly of small sticker-type "tags" that are popular among graffiti artists, and that Anderson has ripped from various places in the subways and streets. Here in his collages, what looks like monotonous repetition actually forms a pictorial narrative that is both a collection of designed information as well as a comment on it, particularly as it relates to our consumer-based society. Tal Hadad also uses collage, but in an audible away. Here he presents "Loaded," a sound installation that is comprised of a series of micro-radio broadcasts of American music hits configured as an audiovisual installation. What you see on the walls are drawings of iconic visuals obtained from mass media made of acoustical wire, but what you hear are pop-music anthems transformed into soundscapes that are a collage of various field recordings from places such as China, Turkey, Rio and New York, creating a global sonic composition. Then there's the macrame, and not just what covers the railing at the main entrance to the galleries. That piece is by the Houston-based group Knitta, which places yarn-made handicrafts in public spaces, much like a "crew" of graffiti artists would. Inside the gallery, Knitta has attacked one wall with their piece "Knitta Please," an installation that features internally lit tubes of macrame that form multicolored, looping spirals. Not far away is another piece literally made of thread, Devorah Sperber's "After Vermeer 2 (The Girl with a Pearl Earring)." 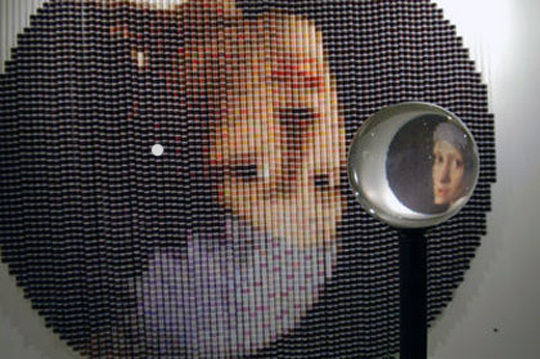 Basically made up of hundreds of thread spools, this hanging work replicates Vermeer's famous painting "The Girl with a Pearl Earring," but through the use of different-colored spools of thread, which here read like pixels. However, the whole composition is hung upside down. That's because about 10 feet in front of the piece is a small crystal ball through which the visitor can look at the work and see how all the spools create the picture, much like pixels on a computer screen. Quite literally on a screen is Carlo Zanni's "The Average Shoveler," an interactive video that presents an online game that straddles the aesthetics of movie, game and real life. Not really a game in the goal-oriented sense, the visitor is encouraged to move the main character -- "The Average Shoveler" -- through New York City during a snow storm. As the character shovels the snow from his meandering path, each clump of snow he launches into the air contains imagery of the day's events taken from an assortment of news and pop-culture media-oriented Web channels. Thus exposing the impossibility to consume -- or shovel away -- the massive amount of information being fed daily to the average citizen. Of all the works on display, that piece might not have the closest association to handicrafts, but, as Thursz says, "In 'Thread,' the crafted object is not as literal as an ornamental object; rather, it is a mediated object that positions the maker's explorations of the abundance of information."